Though we love to get creative in the workshop, certain styles and elements of jewellery remain classic and therefore timeless. These styles are some that we have to incorporate into our work here at Ortwin Thyssen Master Jewellery Makers on a regular basis. All whilst adding our touch to it. We see this often with engagement rings. A very classic engagement ring is the Cluster style ring, which one of our customers became fond of. 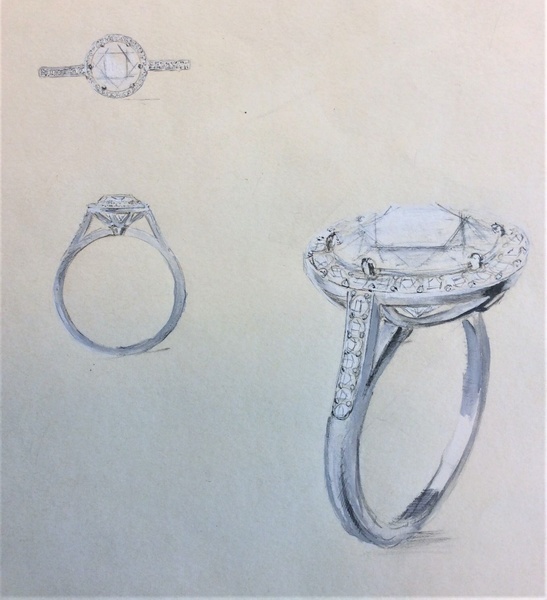 Originally, we had an old sketch of a cluster ring and like many of our customer pieces, they evolve into newer pieces and their detail becomes personalised. Ortwin then went on to create the ring after our customer chose a very dazzling centrepiece stone. A 1.13ct Round Brilliant Diamond. In cluster style the diamond was to be surrounded by 14 Round Brilliant Diamonds that accentuated the brilliance of the centrepiece stone. 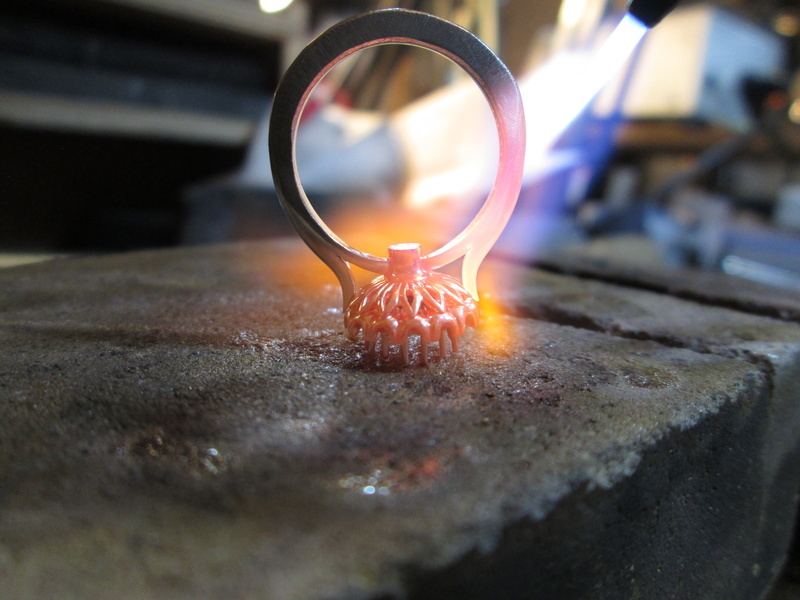 When Ortwin finally sat at his bench to create the ring the personal elements to the piece started coming to life. For hours he patiently worked on the the rings shank and collet, all in the lustrous precious metal, platinum, and finally worked towards setting the stones. Ortwin was able to take some pictures of the making. In the end, the ring was surely a sight to behold. But it was more than just the dazzling centrepiece diamond that brought the ring its brilliance and charm. 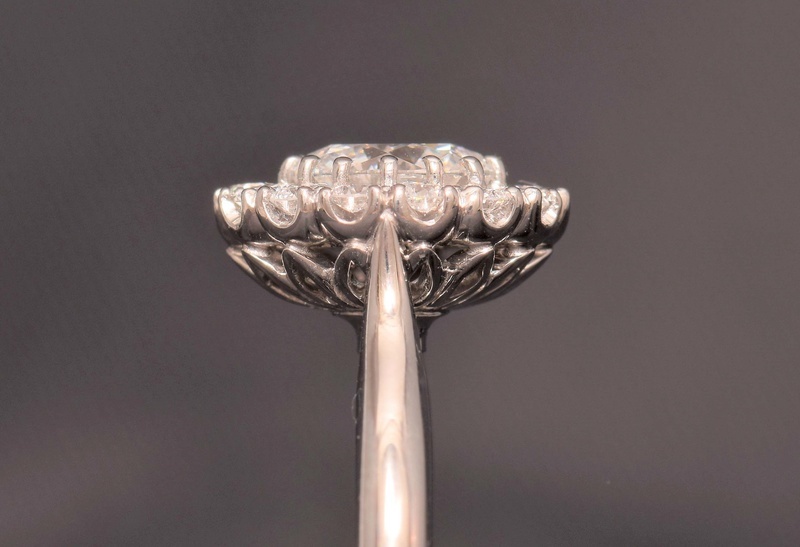 The detail in the basket and the tapper and bareness of the shoulders gave the ring the uniqueness which we strive to maintain within all of our pieces.